I agree with the safety pin campaign. It does not harm anyone in any shape or form. It is a way for many Americans to to protest calmly and silently. I agree with both articles completely because it’s an effective way to bring attention to a cause without causing any hassle like if it was a non-silent protest. 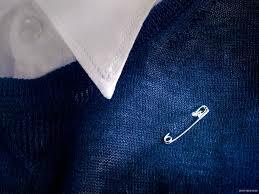 It does bring awareness to the various situations the safety pin is used to bring symbolization of a cause. Safety Pin Campaign by Keziah is licensed under a Creative Commons Attribution-ShareAlike 4.0 International License.